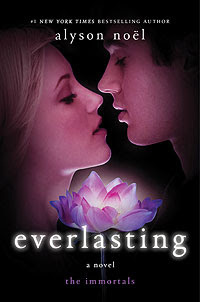 Everlasting was written by Alyson Noel. It is book 6, the final book in The Immortals series. The sixth and final installment of the epic love story that has enchanted readers across the world. Ever and Damen have spent centuries facing down bitter rivals, jealous friends and their own worst fears—all in the hope of being together forever. Now in Everlasting, their destiny is finally within reach. Will they be united—or torn apart forever? Readers will finally discover the truth in this anxiously awaited conclusion! Without giving anything/too much away... I'll just say that the conclusion of The Immortals was just what I thought it would be while still being surprising. I think that's the way a lot of this series was actually. As an example: there were certain characters who would die as the story unfolded (in all of the books) but they never ended without surprising me a little bit in their final scenes. Either my feeling about them dying would give me a feeling I hadn't expected... or Ever would do something that I hadn't expected. The author kept me surprised even while thinking I knew it all. I think there could be one more novel in this series. I would love a look at what happened years after the last page.